You will earn 3,142 Reward Points. Earn 1 reward point for every 1 dollar spent. 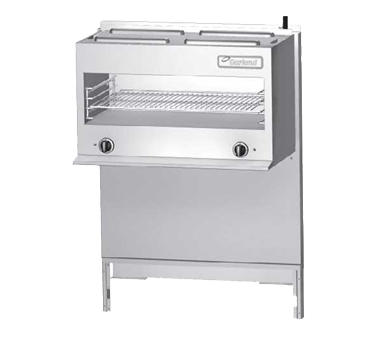 All models have two (2) atmospheric type, 15,000 BTU (4.39 kW) gas infra-red burners. Burners are individually controlled with high and low valve settings. Fast preheat and uniform production are provided by the high-efficiency infrared burners. Unique atmospheric burner design directs heat downward to the heavy chrome plated rack. Sturdy chrome-plated rack guides support the rack, which is adjustable to four (4) positions. Rack and rack guides are easily removed for cleaning. Range mounted cheese melters are securely supported by heavy duty steel brackets.